In just a few short blocks, the Third Street Historic District in the Ocean Park provides visitors a visual history of the development of Santa Monica. 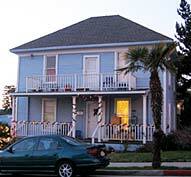 Early on, the Third Street Historic District was the “backyard” of the home of Mrs. Nancy A. Lucas, the first Caucasian to own property in Ocean Park – or South Santa Monica as it was known as way back when. Lucas arrived in 1874, and purchased 861 acres just east of the ocean and south of what is today Pico Boulevard for $11,000, or $14 per acre. The property at 237 Beach St. was originally a farmhouse on her property. Homes were scarce in Ocean Park until the Vawter family settled into the neighborhood in 1884, and proceeded to subdivide their property into residential lots. The Vawter family went on to establish South Santa Monica’s first bank, the first water company, the first Presbyterian Church, and a horse car line connecting it to the rest of Santa Monica. Edwin Vawter owned and operated one of Ocean Park’s first tourist attractions, the Ocean Park Floral Company. Another local family was that of Alvin Archer, the founder of Ocean Park’s first volunteer fire brigade. His wife, Louetta, was Ocean Park’s first post woman. They constructed the American Colonial Revival home four-square with a hipped roof and clapboard siding at 245 Hill Street. Visionary developer Abbot Kinney helped turn South Santa Monica into a beach before developing “Venice of America.” He is the one credited with giving Ocean Park its name, inspired by the eucalyptus groves planted by the Vawters near South Santa Monica Beach. 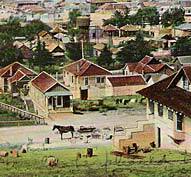 Kinney donated twelve acres to the Santa Fe Railroad so they would extend their Inglewood line north to his resort in Ocean Park. The first train arrived at its Hill Street depot on June 18, 1892. Around this time, the Crystal Springs Bathhouse and Plunge was built--the first South Santa Monica beach attraction. The following spring advertisements appeared for Kinney and Ryan's "Santa Monica Tract." The 25 x 100 foot lots were priced at $100 and featured piped water. As an incentive to purchasers, three small four room cottages were built and a lottery was held. They were given to the lucky buyers who drew the lot on which they stood. Tents were erected on unsold lots and were available to campers for summer rental. The house at 237 Beach is the oldest original structure in the district, dating from around 1880. The First Methodist Episcopal Church at 2621 Second St. is technically older, but it was moved to its present location (from Arizona and Fourth) in 1900. After that, the Hostetter house on the corner of Beach and Second and the house at 242 Beach date from 1893, and 245 Hill St. was erected in 1899. The houses on Third Street itself went up in the decade from 1902 to 1912. 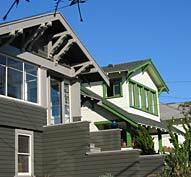 Of the 44 structures in the District, 37 are original, and 29 are in the California Bungalow style. Many feature open porches and have ample land around them offering light on all sides, views to rear yards, and a casual openness that is increasingly rare. • The house at 2619 Third Street is a classic Craftsman bungalow built in 1910. • The former Methodist Episcopal Church at 2621 Second Street is a Victorian Gothic-inspired redwood structure with high-pitched gables. It was built by volunteer labor at a cost of $683. It was sold in 1923 and used for meetings of the women’s auxiliary of Union veterans of the Civil War. In the early 1970s artist Helen Taylor Sheats converted it into a residence. Congregants of the Methodist Episcopal church who previously worshiped in the church that was converted into a residence built a new, larger church on the corner of Second and Hills Streets in 1923. Now called The Church in Ocean Park, it features beautiful stained glass windows. • The airplane style Craftsman bungalow at 2544 Third Street, was originally the home of the Main Street butcher. This property features overhanging eaves, exposed rafters and large, front wrap-around porch. A built-in secretary in the living room has a “Holmes Disappearing Bed” which slides out from a bottom panel. • The home at 2612 Third Street (1912) was built by J.L. Packard, the tobacconist on Main Street. It is a cross-over Victorian/Craftsman with an eyebrow balcony.